We study the effect of thermophoresis on boundary layer magneto-nanofluid flow over a stretching sheet. The model includes the effects of Brownian motion and cross-diffusion effects. The governing partial differential equations are transformed to a system of ordinary differential equations and solved numerically using a spectral linearisation method. The effects of the magnetic influence number, the Prandtl number, Lewis number, the Brownian motion parameter, thermophoresis parameter, the modified Dufour parameter and the Dufour-solutal Lewis number on the fluid properties as well as on the heat, regular and nano mass transfer coefficients are determined and shown graphically. Most common fluids such as water, ethylene, glycol, toluene or oil generally have poor heat transfer characteristics owing to their low thermal conductivity. A recent technique to improve the thermal conductivity of these fluids is to suspend nano-sized metallic particles such as aluminum, titanium, gold, copper, iron or their oxides in the fluid to enhance its thermal properties, Choi . The enhancement of thermal conductivity in nanofluids has been studied by, among others, Kakac and Pramuanjaroenkij , Choi et al. , Masuda et al. , Eapen et al. and Fan and Wang . Nield and Kuznetsov  analyzed the behaviour of boundary layer flow on the Chen-Minkowycz problem in a porous layer saturated with a nanofluid. Nield and Kuznetsov  investigated thermal instability in a porous medium saturated with nanofluid using the Brinkman model. The model incorporated the effects of Brownian motion and thermophoresis of nanoparticles. They found that the critical thermal Rayleigh number can be reduced or increased by a substantial amount depending on whether the nanoparticle distribution is top-heavy or bottom-heavy. Aziz et al. studied steady boundary layer flow past a horizontal flat plate embedded in a porous medium filled with a water-based nanofluid containing gyrotactic microorganisms. Cheng  investigated the behaviour of boundary layer flow over a horizontal cylinder of elliptic cross section in a porous medium saturated with a nanofluid. Chamkha et al. investigated the non-similar solutions for natural convective boundary layer flow over a sphere embedded in a porous medium saturated with a nanofluid. During the last few decades, fluid flow over a stretching surface has received considerable attention because of its engineering applications such as in melt-spinning, hot rolling, wire drawing, glass-fiber production and the manufacture of polymer and rubber sheets, Altan and Gegel , Fisher , and Tidmore and Klein . Nanofluid flow over a stretching surface has been investigated by many researchers. The first study on a stretching sheet in nanofluids was published by Khan and Pop . Makinde and Aziz  performed a numerical study of boundary layer flow over a linear stretching sheet. Both Brownian motion and thermophoresis effects on the transport equations were presented. They reported that stronger Brownian motion and thermophoresis lead to an increase in the rate of heat transfer. However, the opposite was observed in the case of the rate of mass transfer. Recent studies in this area include those of Narayana and Sibanda  and Kameswaran et al. . Magnetic nanofluids have numerous uses or potential applications in engineering and medicine. Using magnetic nanofluids has the potential to regulate the flow rate and heat transfer by controlling the thermo-magnetic convection current and the fluid velocity (see Shima et al. , Ganguly et al. ). The effects of a magnetic field on nanofluid flow over a stretching sheet have been investigated by, among others, Bachok et al. and Hanad and Ferdows . The aim of this study is to analyse Dufour and Soret effects in a magneto-nanofluid flow over a stretching sheet. In addition, we study Brownian motion and thermophoresis effects using a spectral linearisation method to obtain numerical solutions of the momentum, energy, concentration and mass fraction equations. The successive linearisation method (SLM) is an accurate method for solving non-linear coupled equations (see [23–25]). Recent studies such as [26–28] have suggested that the SLM is accurate and converges rapidly to the numerical results when compared to other semi-analytical methods such as the Adomian decomposition method, the variational iteration method and the homotopy perturbation method. f = 0 , f ′ = 1 , θ = 1 , S = 1 , ϕ = 1 at η = 0 , f ′ → 0 , θ → 0 , S → 0 , ϕ → 0 as η → ∞ . M = σ B 0 2 ρ f a , Pr = ν α , Le = α D S , Nb = τ D B ( ϕ ˆ w − ϕ ˆ ∞ ) ν , Nt = τ D T ( T w − T ∞ ) T ∞ ν , Ln = ν D B , Nd = D T C ( C w − C ∞ ) α ( T w − T ∞ ) , Ld = D C T ( T w − T ∞ ) D S ( C w − C ∞ ) . Nu x = − x T w − T ∞ ( ∂ T ∂ y ) | y = 0 = − Re x 1 2 θ ′ ( 0 ) , Shr x = − x C w − C ∞ ( ∂ C ∂ y ) | y = 0 = − Re x 1 2 S ′ ( 0 ) , Sh x , n = − x ϕ ˆ w − ϕ ˆ ∞ ( ∂ ϕ ˆ ∂ y ) | y = 0 = − Re x 1 2 ϕ ′ ( 0 ) . Nur = Nu x / Re x 1 2 , Shr = Sh x , n / Re x 1 2 and Sh = Sh ˆ x / Re x 1 2 . F 0 ( η ) = 1 − e − η , Θ 0 ( η ) = e − η , S ˜ 0 = e − η , Φ 0 ( η ) = e − η .
η L = ξ + 1 2 , − 1 ≤ ξ ≤ 1 . T k ( ξ ) = cos [ k cos − 1 ( ξ ) ] . A i − 1 = [ A 11 A 12 A 13 A 14 A 21 A 22 A 23 A 24 A 31 A 32 A 33 A 34 A 41 A 42 A 43 A 44 ] , X i = [ F i Θ i S ˜ Φ i ] , R i − 1 = [ r 1 , i − 1 r 2 , i − 1 r 3 , i − 1 r 4 , i − 1 ] . F i = [ f i ( ξ 0 ) , f i ( ξ 1 ) , … , f i ( ξ N − 1 ) , f i ( ξ N ) ] T , Θ i = [ θ i ( ξ 0 ) , θ i ( ξ 1 ) , … , θ i ( ξ N − 1 ) , θ i ( ξ N ) ] T , S ˜ i = [ S i ( ξ 0 ) , θ i ( ξ 1 ) , … , S i ( ξ N − 1 ) , S i ( ξ N ) ] T , Φ i = [ ϕ i ( ξ 0 ) , ϕ i ( ξ 1 ) , … , ϕ i ( ξ N − 1 ) , ϕ i ( ξ N ) ] T , r 1 , i − 1 = [ r 1 , i − 1 ( ξ 0 ) , r 1 , i − 1 ( ξ 1 ) , … , r 1 , i − 1 ( ξ N − 1 ) , r 1 , i − 1 ( ξ N ) ] T , r 2 , i − 1 = [ r 2 , i − 1 ( ξ 0 ) , r 2 , i − 1 ( ξ 1 ) , … , r 2 , i − 1 ( ξ N − 1 ) , r 2 , i − 1 ( ξ N ) ] T , r 3 , i − 1 = [ r 3 , i − 1 ( ξ 0 ) , r 3 , i − 1 ( ξ 1 ) , … , r 3 , i − 1 ( ξ N − 1 ) , r 3 , i − 1 ( ξ N ) ] T , r 4 , i − 1 = [ r 3 , i − 1 ( ξ 0 ) , r 3 , i − 1 ( ξ 1 ) , … , r 3 , i − 1 ( ξ N − 1 ) , r 3 , i − 1 ( ξ N ) ] T , A 11 = D 3 + a 1 , i − 1 D 2 + a 2 , i − 1 D + a 3 , i − 1 I , A 12 = [ 0 ] , A 13 = [ 0 ] , A 14 = [ 0 ] , A 21 = b 2 , i − 1 I , A 22 = D 2 + b 1 , i − 1 D , A 23 = b 3 , i − 1 D 2 , A 24 = b 4 , i − 1 D , A 31 = c 2 , i − 1 I , A 32 = c 3 , i − 1 D 2 , A 33 = D 2 + c 1 , i − 1 D , A 34 = [ 0 ] , A 41 = d 2 , i − 1 I , A 42 = d 3 , i − 1 D 2 , A 44 = [ 0 ] , A 43 = D 2 + d 1 , i − 1 D .
X i = A i − 1 − 1 R i − 1 . In this section we present solutions of equations (8)-(11) along with the boundary conditions (12) using the SLM iteration scheme. Tables 1 and 2 give a comparison between the present results and Khan and Pop  for the reduced Nusselt and Sherwood numbers respectively. There is a good agreement between the two sets of results with the SLM having converged at the fourth order up to eleven decimal places. The velocity components f ( η ) and f ′ ( η ) are plotted in Figures 1(a) and 1(b) for different values of the magnetic field parameter M. As is now well known, the velocity decreases with increases in the magnetic field parameter due to an increase in the Lorentz drag force that opposes the fluid motion. Effect of the magnetic field M on the velocity components (a) f ( η ) and (b) f ′ ( η ) . Figures 2(a) and 2(b) show the effect of the thermophoresis parameter on the temperature and mass volume fraction profiles. The thermophoretic force generated by the temperature gradient creates a fast flow away from the stretching surface. In this way more fluid is heated away from the surface, and consequently, as Nt increases, the temperature within the boundary layer increases. The fast flow from the stretching sheet carries with it nanoparticles leading to an increase in the mass volume fraction boundary layer thickness. Effect of the thermophoresis parameter Nt on the temperature θ and nanoparticle ϕ profiles. 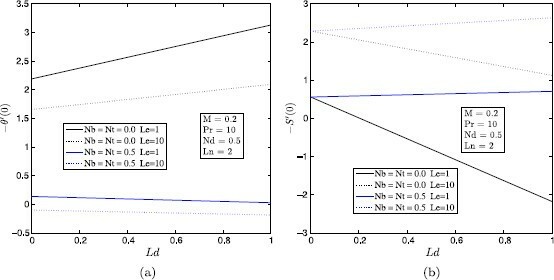 Figures 3(a) and 3(b) show the effect of the Lewis number Le, and the Dufour-solutal Lewis number Ld on the species concentration in the boundary layer. The concentration profiles significantly contract as the Lewis number increases. The effect of the random motion of the nanoparticles suspended in the fluid on the temperature and nanoparticle volume fraction is shown in Figures 4(a) and 4(b). As expected, the increased Brownian motion of the nanoparticles carries with it heat and the thickness of the thermal boundary layer increases. The Brownian motion of the nanoparticles increases thermal transport which is an important mechanism for the enhancement of thermal conductivity of nanofluids. However, we note that increasing the Brownian motion parameter leads to a clustering of the nanoparticles near the stretching sheet. An increase in the Brownian motion of the nanoparticles leads to a decrease in the mass volume fraction profiles. Effect of the Lewis number Le and the Dufour-solutal Lewis number Ld on concentration profiles. Effect of the Brownian motion parameter Nb on the temperature and nanoparticle volume fraction profiles. Figures 5(a) and 5(b) show the temperature profiles for several values of the Prandtl number Pr and mass volume fraction profile for several values of the modified Dufour number Nd. The temperature profiles decrease as the Prandtl number increases since, for high Prandtl numbers, the flow is governed by momentum and viscous diffusion rather than thermal diffusion. On the other hand, the thickness of the mass volume fraction boundary layer increases with an increase in Nd. Effect of Pr and Nd on the temperature θ , profiles respectively. 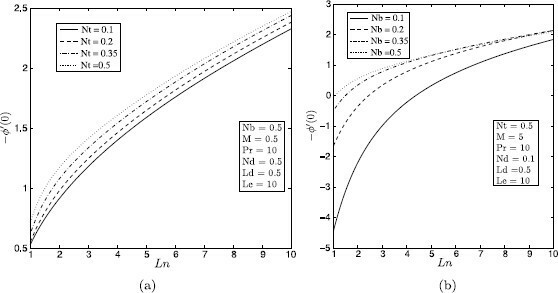 Figures 6(a) and 6(b) show the effects of the thermophoresis parameter Nt, the Lewis number Le, the magnetic field parameter M, the Prandtl number Pr and the modified Dufour number Nd on the wall heat and mass fraction transfer rates. It can be seen that the thermal boundary layer thickness increases when the thermophoresis parameter Nt increases, thus decreasing the reduced Nusselt number. However, increasing the Lewis number Le leads to a decrease in the reduced Nusselt number. On the other hand, the results show that the reduced Nusselt number increases with increasing Prandtl numbers. Increasing both the magnetic field parameter M and the modified Dufour parameter Nd leads to an increase in the thermal boundary layer thickness, thus reducing the Nusselt number. Effect of Nt , Le , Pr , Nd and M on the heat transfer coefficient Nur . Figures 7(a) and 7(b) show the effects of the Dufour-solutal Lewis number Ld and the nanofluid Lewis number Ln on the reduced Nusselt number Nur as the Brownian motion parameter Nb increases. We note a decrease in the reduced Nusselt number when Ln increases, and an increase in the reduced Nusselt number when Ld increases. Effect of the Dufour-solutal Lewis number Ld and the nanofluid Lewis number Ln on the reduced Nusselt number Nur . Figures 8(a) and 8(b) show the graphs of − θ ′ ( 0 ) and S ′ ( 0 ) plotted against the Dufour-solutal Lewis number Ld for different values of the parameters Nt, Nb and Le. We observe that − θ ′ ( 0 ) increases in the absence of the Brownian motion and the thermophoresis parameter while − θ ′ ( 0 ) decreases in the presence of Brownian motion and thermophoresis parameters. An increase in − S ′ ( 0 ) is observed in the presence of both the Brownian motion and the thermophoresis parameter. Figures 9(a) and 9(b) show the effect of increasing Nt and Nb respectively on the reduced Sherwood number − ϕ ( 0 ) . Effect of the Lewis number Le , the thermophoresis parameter Nt and the Brownian motion parameter Nb on (a) the reduced Nusselt number − θ ′ ( 0 ) and (b) the local Sherwood number − S ′ ( 0 ) . Effect of the nanofluid Lewis number Ln , the thermophoresis parameter Nt and the Brownian motion parameter Nb on the nanofluid Sherwood number − ϕ ′ ( 0 ) . – the heat transfer coefficient increases in the absence of the Brownian motion and the thermophoresis parameter and decreases in the presence of Brownian motion and thermophoresis parameters. The work including proofreading was done by all the authors.